I am one of those horribly annoying people who loves being pregnant. I have mentioned that on here before, and it just is what it is. I love eating Bojangles whenever I want. I love giving up the Spanx for a season and just lettin' it all hang out there. I love the way my husband looks at me - his face filled with wonder that my body is doing this. Again. Yes, I complain about it from time to time. Yes, I am grouchy some days. And, yes, just like everyone else, it starts to get really difficult at the end and I WANT THIS BABY OUT, OUT, OUT! But, even though my body has gotten older, my pregnancies have gotten easier each time and I think that has contributed to my take on things. My (smaller than...shhh) five-foot frame birthed an eight pound baby my first time around. This was just days after my 39-week appointment when my doctor wrapped her hands around my belly and announced, "I think you've got about a six-pounder in there. Just right for your size." Oh, no. Oh, no, no, no, no. When she pulled Jack out a few days later and the nurse announced that he was indeed, EIGHT POUNDS, my doctor looked over the curtain at me and said, "I am so sorry, Sarah. I had no idea you were carrying a baby that big or I never would have let you go this long." Since then, I've had all 6ish pound babies - anywhere from 36-37 weeks. And, each one has been easier to carry than the previous one. I have taken it for granted at times - being able to carry and grow five children. I know that I have. But, as I've gotten older and matured, God has given me a deeper sense of gratitude for this tremendous gift of being a mother. And, I suppose that ever-growing sense of thankfulness, as thankfulness often does, has changed my perspective. Yesterday, Jason snapped a few photos of me and my ever-expanding belly. I don't particularly like having my picture taken (hence the lack of photos of me on here), but somehow, when he's behind the camera, I don't mind as much. He makes me feel beautiful - and, very, very loved. So beautiful. And I love being pregnant too. Not enough to do it a seventh time (I think), but I do love it. Some girls are just born "mothers" and you are one of them. So fun to follow your news about your great kids and how you are enjoying this time around. My God bless you and your family as you live out your life for Him. Sarah, you're so cute! I wish I looked half as good when pregnant. 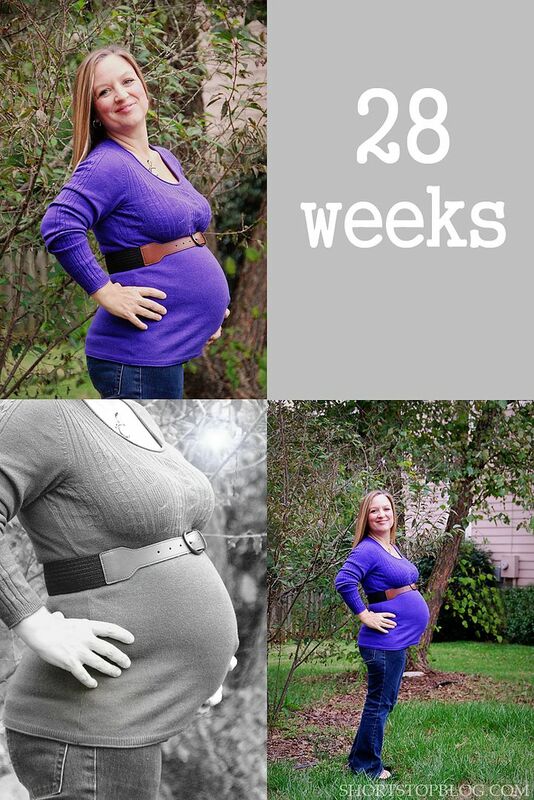 I also carry babies about 41 weeks and each weighs more than the last--my 3rd was 11 lbs! I would let the doctor induce labor earlier, but we tried that the first time around and it failed. Sigh... Enjoy it! Can't wait to meet your new bundle! Love ya! Thanks for sharing your beauty! I loved being pregnant too. I don't think I was near as cute as you are when pregnant though. so beautiful, Children are indeed a blessing. There is something so amazing about feeling that strong life kicking from within, what a miracle!